We are recruiting pharmacists for a German employer. A recruitment day will be held in Rome, Italy, on Monday 18th of March. The selected candidates will follow first a hospitation/traineeship period, which includes observation and language training, before passing the obligatory exam to obtain the Approbation. A permanent contract will be offered once the worker has obtained the Approbation. 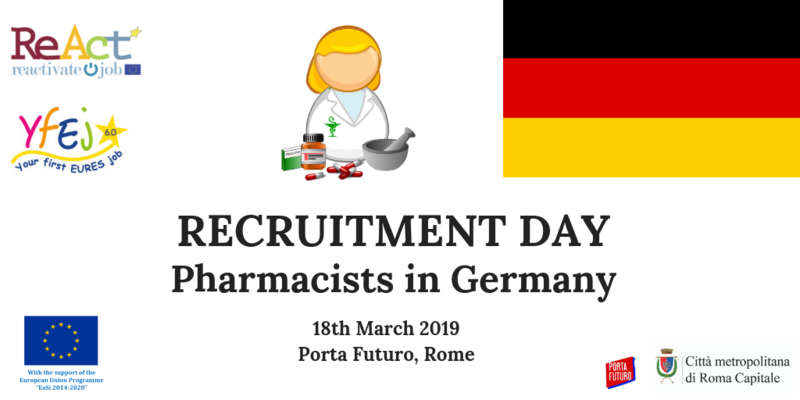 To participate in the recruitment day, you must register on YfEj Platform and send an email to jobmobility@cittametropolitanaroma.gov.it indicating “Recruitment day Pharmacists – Rome 18 March 2018” in the object. You will be given further information and instruction to complete the registration to the event.